Clocks, Watches & Scientific Instruments | Historic Militaria | Skinner | Skinner Inc.
BOSTON, MA – October 7, 2013 – Skinner, Inc. will host its fall auction of Clocks, Watches & Scientific Instruments on November 2, spotlighting a wonderful selection of fine timekeepers and mechanical masterpieces. A section of Historic Arms & Militaria will also be offered, including important examples of military weaponry, uniforms, historical documents and more. A number of interesting American timekeepers will be featured, including a Joshua Wilder Mahogany Shelf Clock, Massachusetts, c. 1815 (lot 472, estimated between $30,000 and $50,000). This clock is as much a beautiful example of New England folk art as it is a fine timepiece, featuring a charming painting of a child feeding chickens. Also available is an Aaron Willard Painted Shelf Clock Boston, c. 1815 (lot 474, $30,000 to $50,000). 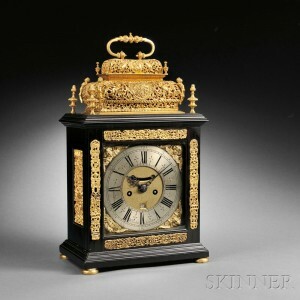 Designed by one of the famed Willard brothers, this clock is exemplary of fine Federal furniture. The “Gilded Age” of English clock making is represented by several important pieces in this sale; notably, an exquisitely preserved Thomas Lumpkin Long Case Clock, c. 1695 (lot 282, $15,000 to 25,000) and, a William Speakman Quarter-Repeating Bracket Clock (lot 284, $20,000 to $30,000). A late 18th century Charles Cabrier Musical Table Clock (lot 294, $15,000 to $20,000) will also be offered. This dazzling work of art, featuring a moon’s age dial, plays six different tunes. A French “Floor Regulator” by Allard, c. 1815 (lot 393, $20,000 to $40,000) is another outstanding offering. Highly sophisticated and innovative for its era, this piece calculates mechanical time, sun time and even compensates for changes in temperature, making the early 19th century masterpiece nearly as accurate as an atomic clock. The November 2 auction will also feature a variety of important early navigational tools, including a Daniel King Boxwood and Brass Circumfernator, Salem, Massachusetts, c. 1758 (lot 622, $8,000 to $12,000). A truly rare piece, this offering represents one of only a few examples of Daniel King’s works that have survived to the present day. Also available is a Silver Equinoctial Sundial by Dollond, London, mid-18th century, (lot 626, $700 to $900). This “pocket” sundial features a silvered hinged hour ring with Roman numerals and arrives in its own custom velvet-lined, leather-clad carrying case. Following the success of Skinner’s first auction of this material, Specialist Joel Bohy presents a diverse selection of historic canons, pistols, swords, and more on November 2. One of the highlights of this section of the sale is a collection of objects related to Rear Admiral Frank Wildes, including an 18K gold presentation sword made by Bigelow and Kennard and given to him by the city of Boston in 1901 (lot 97, $20,000 to $30,000). The discovery of the sword is a fascinating tale unto itself. It arrived in a locked box, which the consignor, Admiral Wilde’s great-great granddaughter, had never opened. With permission from the consignor, Skinner unlocked the box – for the first time in over a century – to reveal a luminous, glittering, gold sword. Wilde had received the sword from his hometown for gallantry during the Spanish-American War. This portion of the auction will also feature a factory engraved and identified Colt Navy revolver (lot 43, $8,000 to $12,000). While these pistols are valuable in their own right, what makes this particular offering so special is that the engraving indicates that the gun was presented to its owner, Captain T.J. Eubanks of Alabama, for bravery in the Battle of Gettysburg. 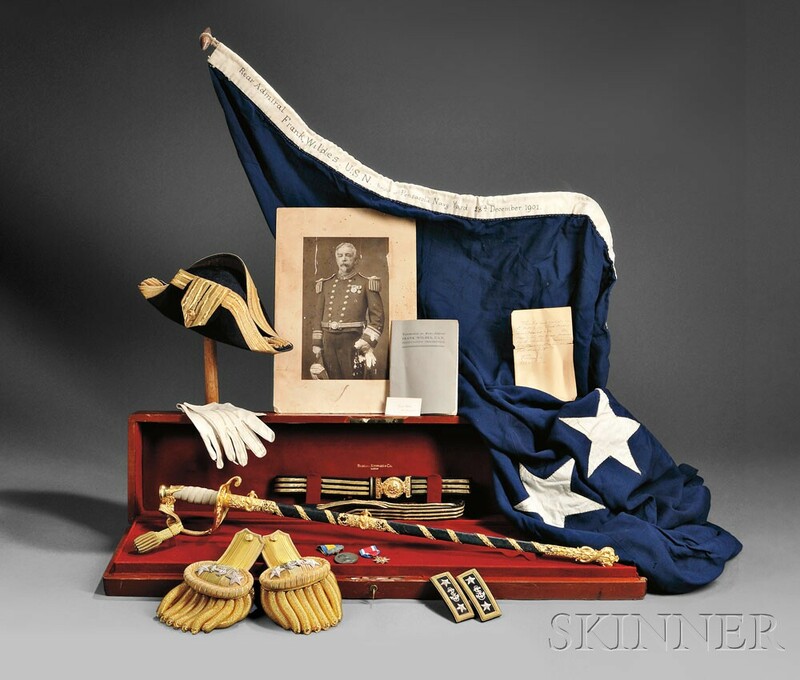 Civil War history comes alive again with a group of items belonging to Colonel Thomas F. Gallagher, a Pennsylvania reservist (lot 160, $3,000 to $6,000). 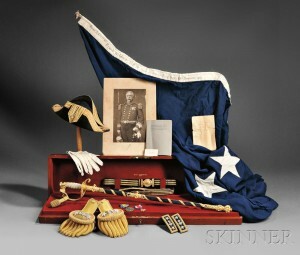 The grouping consists of his frock coats, saddle, and trunk, as well as a memorial to G Company of the 11th Pennsylvania Reserves, among several other pieces. Military buttons are also plentiful in this auction, spanning the Revolutionary War to the Civil War. Highlights include a Seventh Massachusetts Regiment Button (lot 205, $400 to $600), 17 Virginia Buttons from the mid- to late-19th century (lot 223, $600 to $800) and an imported Confederate Engineer Button, c. 1861-65 (lot 229, $800 to $1,000). Previews for the auction will be held on Thursday, October 31, from noon to 5 PM, Friday, November 1, from noon to 7 PM., and Saturday, November 2, from 8 AM to 9:30 AM. Illustrated Catalog #2684M is available from the Subscription Department, at 508-970-3240, or from the Gallery. Prices realized will be available online at www.skinnerinc.com, both during and after the sale. The Skinner website enables users to view every lot in the auctions, leave bids, order catalogs and bid live, in real-time, through SkinnerLive! the SkinnerLive! online bidding platform. For more information and to read our blog, visit the Skinner website at www.skinnerinc.com, find us on Facebook at https://www.facebook.com/skinnerauctions, or follow us on Twitter @Skinnerinc. This entry was posted in News and tagged american clocks, antique clocks, antique muskets, antique pistols, antique swords, auction, Bigelow and Kennard, Civil War, compass, E Howard, european clocks, french clocks, horological, Joel Bohy, Militaria, military antiques, musical clocks, navigational instruments, precision regulator, revolutionary war, Robert Cheney, scientific instruments, timepieces, Willard by Skinner. Bookmark the permalink.